Kristin and I have set up a little monument of sorts in our living room. You know, the Joshua 4 kind that testifies to God’s power and goodness, but slightly less permanent than the 12 stones. 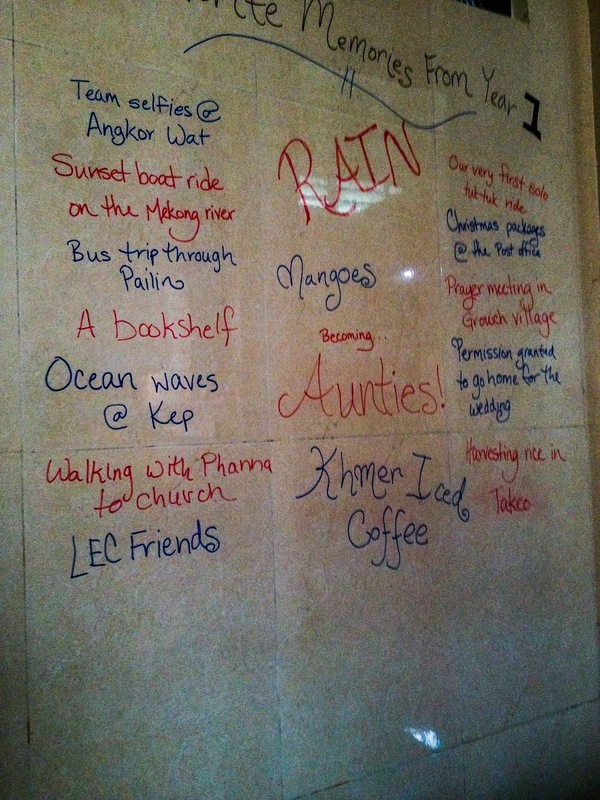 Our own reflection scribbled with markers on our tile wall has come about because of the one-year anniversary of our arrival in Cambodia. 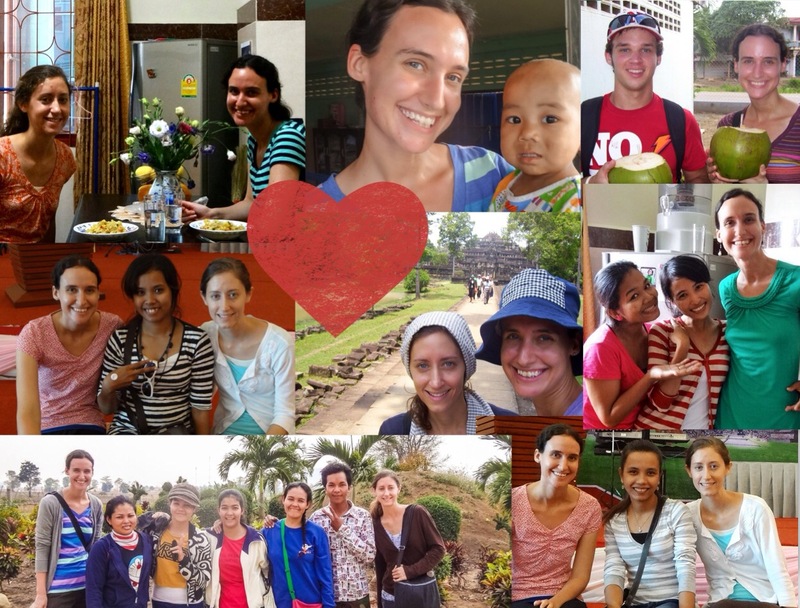 Exactly one year ago, we stepped out of the air conditioned airport into the heat and humidity, piled in a tuk-tuk with all our worldly possessions, and began a journey of trusting in God through these last 12 months. We have been remembering all of the firsts- when we started language school and all we could say was “Hello, how are you, sister?” Our teacher made us practice right away with the other teachers and people on the street, and I laugh now imagining how terrible it must have sounded. We could barely tell our tuk-tuk driver where we wanted to go, but I guess we managed because we always ended up in the right spot. The “honeymood” period wore off and we discovered how exhausting operating in a second language can be and the importance of Sabbath out of necessity. It seems every time I was ready to give up, or I wondered how in the world I was going to make it, God knew and He met me there. He provided encouragement, always. Perhaps it was in the form of a bookshelf, something so simple, but I remember the joy of bringing that home and filling it up. It was sometimes in an especially strong thunderstorm, the monsoon rain pouring down and thunder so loud it shook the house and reminded me of God’s power. Most often, it was in the form of our sweet friends, the people that cheered us on, pushed us because they knew we could do it, celebrated our birthdays with us, showed much grace when we didn’t understand and explained something over and over. I have learned from their own walks with The Lord, loved studying His Word in their heart language. While I have not enjoyed several bouts with parasites, the constant battle with critters in a our apartment, and a few other frustrations that come with life in this country, I wouldn’t trade it for what I have seen God do, the ways He is working in the hearts of the Khmer people and in my own heart. I know that His purpose remains through it all, and He is the reason that we celebrate making it to this one year mark. Our message in church this morning was on memorials; your wall is fitting for Memorial Day!